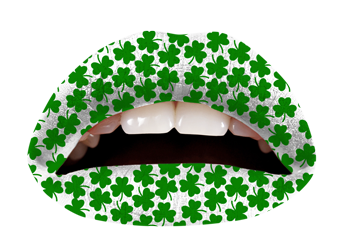 St. Patrick`s day is coming. You’ll have plenty of time to experiment with your makeup that day before you hit the bar crawl. We will recommend you some brave ideas to make that day of the year unforgettable for you. There are some professional looks that can meet all your requirements. We offer you different ideas for different types of personalities. So, you can find the one that fits most to your style and desires. Implementing all symbols of luck that are typical for that event, choosing one of them you will be unique and fashionable enough. 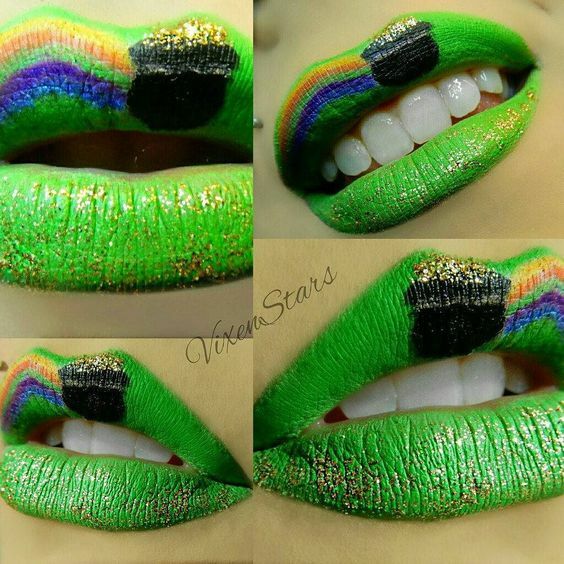 Just spend some time in looking through all these 19 fresh ideas of lip makeup. Choose one of them and we promise you to gather tones of admirations about your appearance. It’s not a look that most of us will dare to wear with ease. 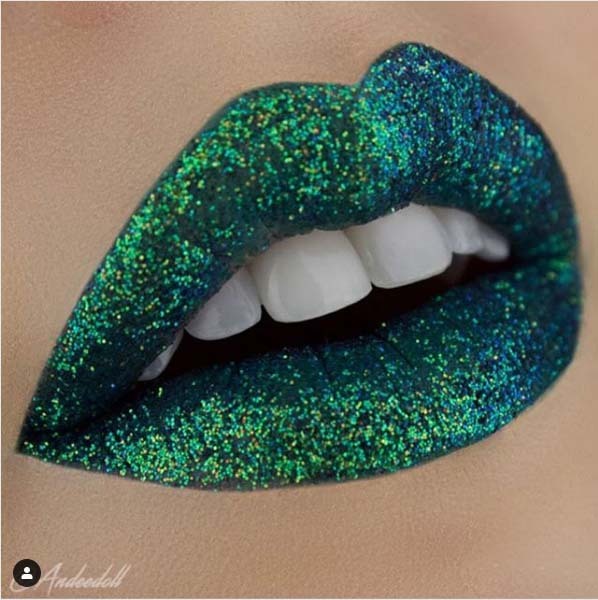 It is really a brave combination between green and silver lipstick and that artistic drawing on the upper lip but more and more makeup artists are working with what would usually be considered “odd” makeup shades. This lips makeup is a prime example of this. Despite your reservations, this beautiful lips makeup just goes to show how easy it could be to attract tones of attention on that special day. The question is – are you brave enough to rock this extravagant style? 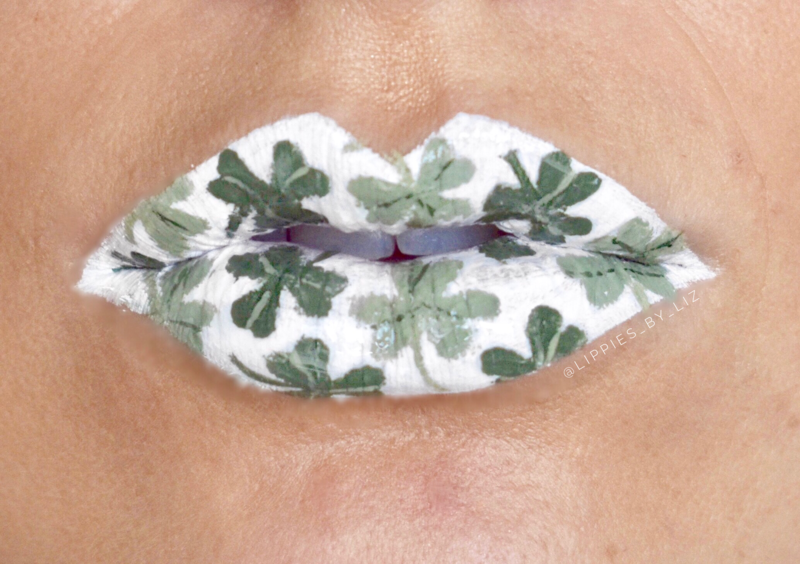 If you wanted to pay some special attention to your lips, rather than your eyes, this black lip with grey clovers for St. Patrick’s Day might just fit the bill. 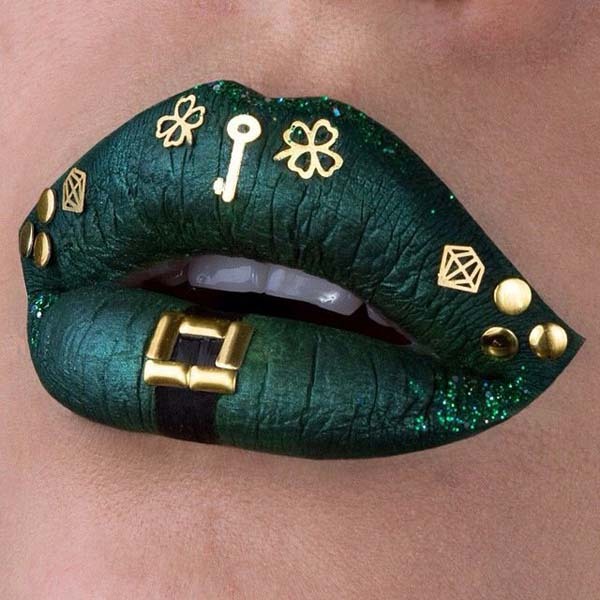 That black lip shade is simply to die for, and the grey clovers adds something extra cool to the occasion. You’d probably need to sip your drinks carefully through a straw, but it’d be worth it to rock fab lips like this for a little while. 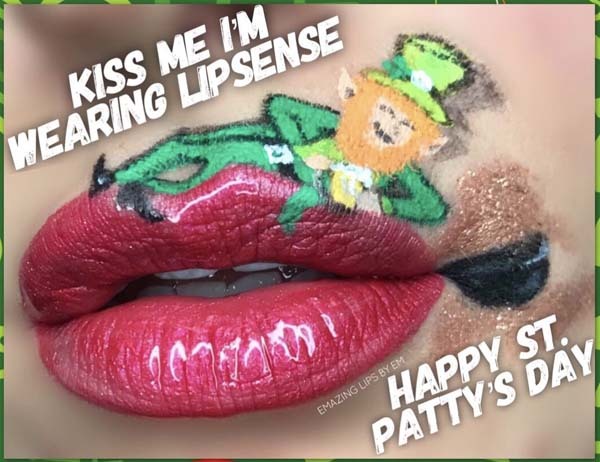 Another good choice for that day of the year – that deep green lips is a perfect base for these pretty lucky symbols of gold. The combination is not only fresh but stylish. It is appropriate for both day and night makeup. It requires special skills, so be ready to spend some money and time visiting your favorite beauty salon. Just dare to try this brave idea. It is really fun, isn`t it? All these bright colors will bring fresh and fun atmosphere to that day and will make you even more special. This look is suitable for girls and young ladies. It is more practical to be worn throughout the day because of its bright shades. I deeply recommend you this opt. Four leaves clover is the luckiest symbol. And the black color is the perfect base. This look reminds of a heavy rock and roll style. So, it is usually worn by teenagers. Because of its dark shades it is appropriate for the night. 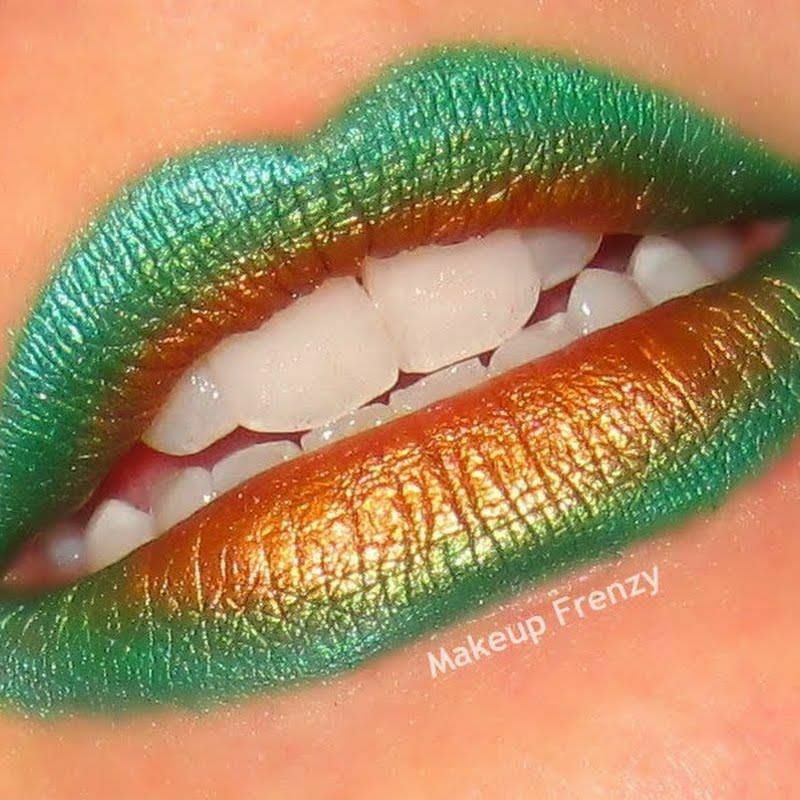 If you wanted to put the basic accent on your lips, rather than your eyes, this green and gold lip look for St. Patrick’s Day might just fit the bill. 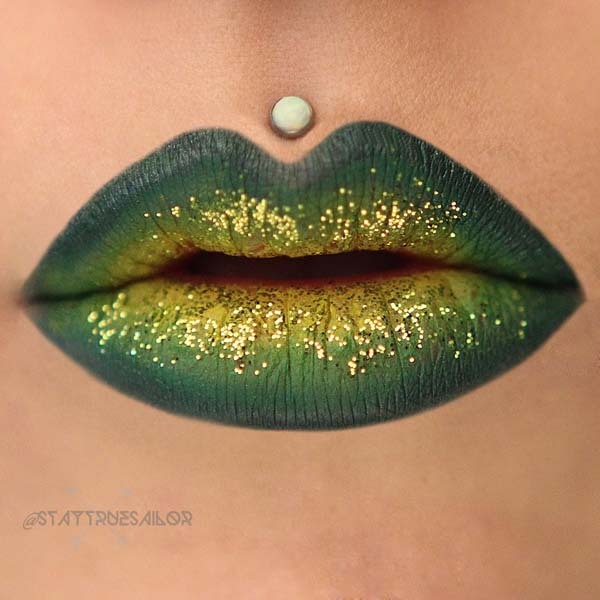 That green lip shade is simply to die for, and the spattering of gold glitter adds something extra cool to the occasion. So, do not forget to use a straw while sipping your drinks not to spoil the whole artistic look. 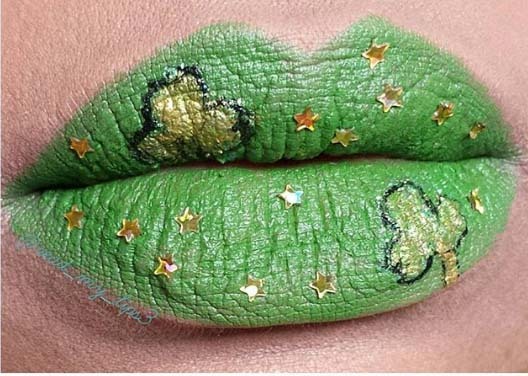 This St. Patrick`s lips makeup is the perfect proof that green is brilliant for party atmosphere. 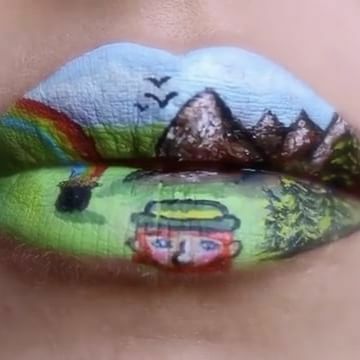 Using all your artistic skills and playing with all the shades of green you can achieve that amazing effect. So, be ready for the tones of attention. Just enjoy that day full of luck and fun. Who says that these colors does not go together. It is just because you have no imagination. They are both earth colors. 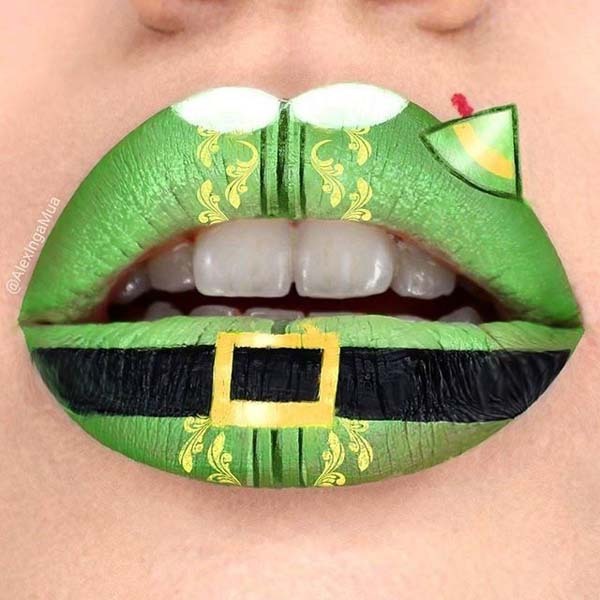 Those green beauties might not be the first thing you consider when throwing your green and brown-themed makeup for St Patricks Day, but they certainly work, as this makeup design shows you. Would go green on the brows for the big day? We’d love to know your thoughts. 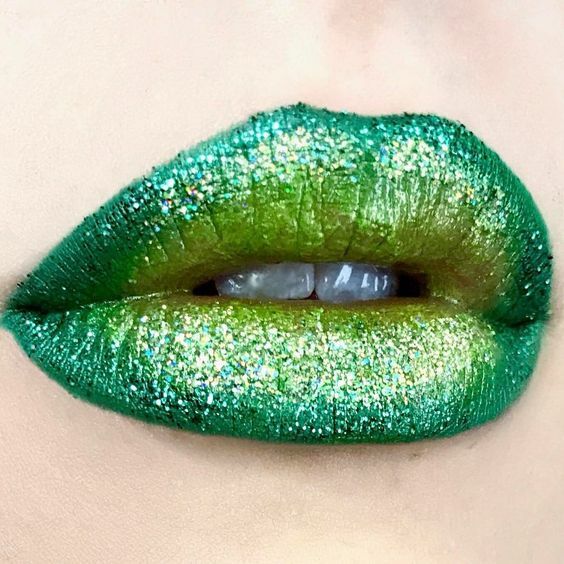 For when you want to put everything green at the occasion, should not be afraid to match your lips to your eyes. That is something we’re sure you’ve been told to avoid on more than one occasion over the years. It’s very simple, just match the shades up as best as you can and keep things relatively simple. 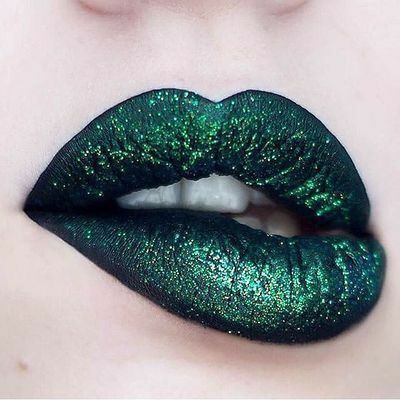 If glam is what you’re looking for, this appearance has it by the bucket loads, mixing a dark metallic green-lip with a shimmering green eye. There’s a hint of glitter and so much sass and glam in this look, we almost can’t handle it. If you wanted to be a killer green queen this St. Patrick’s Day, this is definitely the perfect opt to achieve just that with. If fun is what you are looking for, this is the best choice for you. 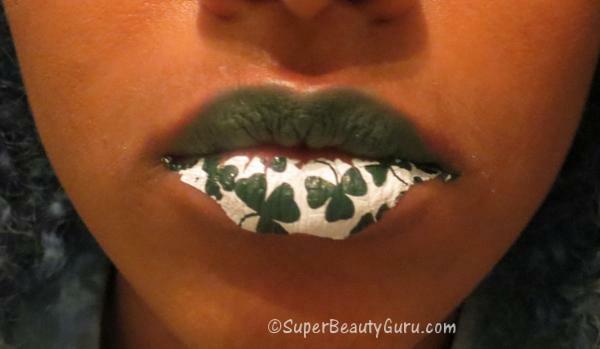 This type of St. Patrick`s day lips makeup is not so difficult to be made at home. So, it depends on you if your lips will look just the way in the picture. There are so many opts to be unique at that special day and this look is one of them. If you want to express your personality in an extravagant way, why don`t you choose this strange combination of white as a base of green clovers. At looks like an artificial lip, but it is not. 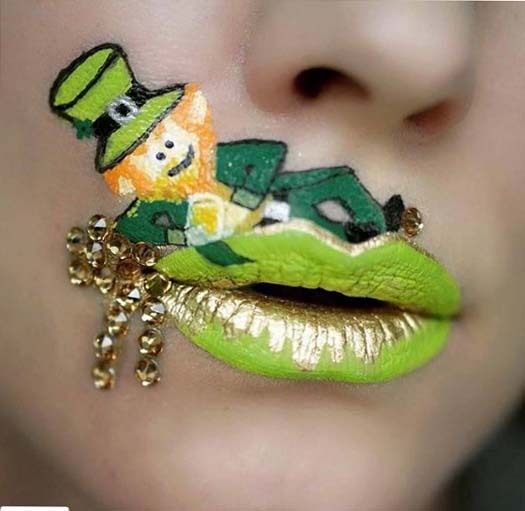 If you are skillful enough you can achieve that impressive look for St. Patrick`s day. The white color is not typical for a lip stick. But for that day it is a perfect base for all these lucky clovers. The white gives that special accent and makes the event the luckiest and funniest. The lips look so sweet and soft in that color. And also they are a comfortable cloud for that symbolic man of luck. Really a brave artistic opt just to guarantee that you will be the star. Just go for that brave idea and see what will happened. Yes, pot of gold and a rainbow on the upper lip. It seems a little bit difficult but not impossible to do it home. 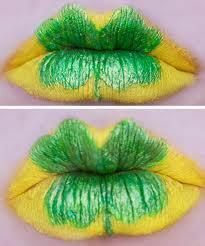 If you are patient enough, you can successfully draw these symbols on the green based upper lip. At the end you won`t be sorry. The look that you intend to impress will be fabulous. May be this is the easiest and the most attractive look of St. Patrick`s day lips makeup. You need just these three colors – green, orange and white. Another extravagant opt for those who dare to be unique and unforgettable. There is no doubt that white is very unusual for lips makeup, but is the perfect base for those lucky clovers. That is a typical choice for the most artistic personalities. If you really like the countryside and you are totally inspired by it this is the way to show the others the greatest love that`s deep in you. And the event is perfect for that appearance. This is the freshest combination of colors. Bright white and bright green. 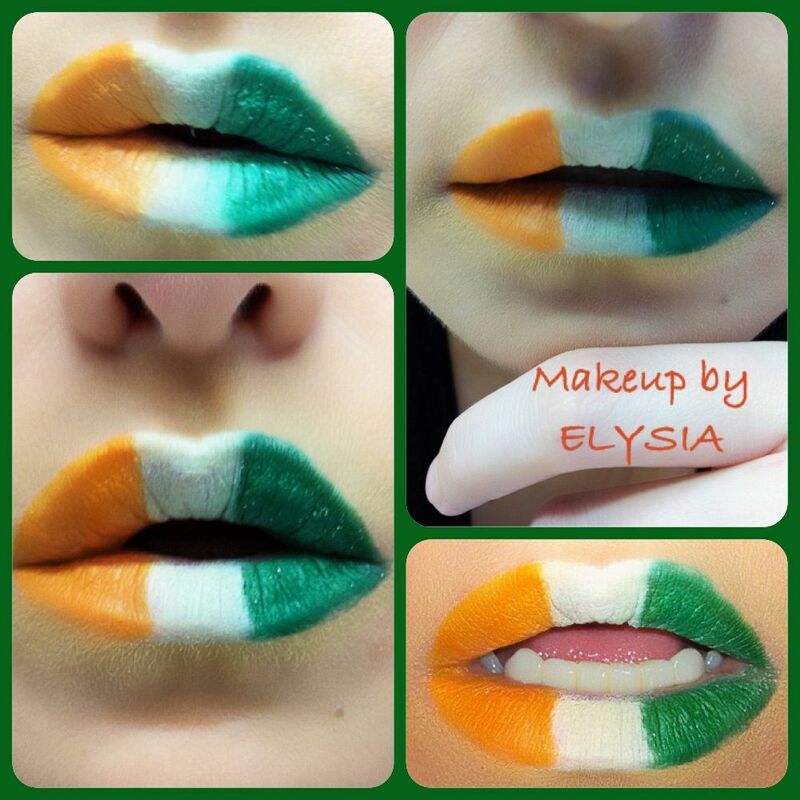 St. Patrick`s day is perfect for experimentation with all these unusual colors for lips makeup. Be brave and feel the entire colorful brightness. The greatest advantage of this lip makeup is that you can do it yourself. It doesn`t require any special skill in drawing, just a little imagination. Be part of this holly spirit and let you be the luckiest one not only at that special event.